Great Barrier Island offers a wide variety of accommodation for your holiday or vacation. From luxury lodges, self-contained houses, hideaway cottages, bed and breakfast to hillside cabins and budget backpackers. Idyllic surroundings with stunning sea or bush views, abundant bird song and a friendly welcome. Something for everyone and for every budget. Mickey's Campground Ph 09 4290 140 or 09 4290 170. Flat sites, on a farm, under mature trees. Near the bush and the beach. On the main road. Buses daily. Hot showers, flush toilets, No animals. $5 per person. Kaitoke is Maori for 'edible earth worms'. 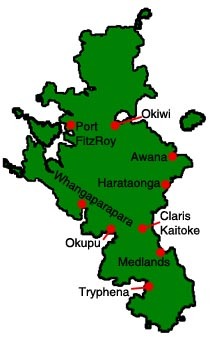 The traditional Maori name for the area is Oruawharo. The name applies to the bay, the small islet and the pa standing on the foreshore in the middle of the beach. The name dates back to the 14th century and the arrival of the Takitimu canoe on which Ruawharo was the leading chieftain. The name also applies to the Sugarloaf where Ruawharo lived for a time although the Sugarloaf and the two larger offshore islands near it were also collectively referred to as 'Pitokuku' as their shape is likened to the pointed end of a mussel shell. White sandy beach for surfing, swimming, snorkeling and fishing. Boat launch area. Sleeps up to 12 in 4 bedrooms. 1 king & 3 queen bedrooms, sleeps up to 8. 1 double & 1 bunkroom, sleeps 5. Medlands Beach Camp Enjoy being in the heart of Medlands, relaxing at your own sunny and private camp site, amongst an abundance of bird life. Sheltered by mature trees a large grassy area provides ample room for tents.A simple structure contains a basic kitchen including all cooking needs. A traditional Maori place name that means 'the place of the kiwi' although kiwi are not known to have inhabited this area. Airport. White sandy beach for surfing, swimming, kayaking, fishing. Historic site (Wairarapa Graves) nearby.. Traditionally known as Okupe or the place of Kupe, a famous chief who stayed there while improvising his canoe for ocean voyages. Sandy beach for swimming, fishing - boat ramp. Named after the first Governor, Robert FitzRoy, and spelt by the Captain of the HMS Beagle on Darwin's voyage, with a capital 'R' apparently to emphasize his royal (if unofficial) descent from Charles FitzRoy, first Duke of Southampton. 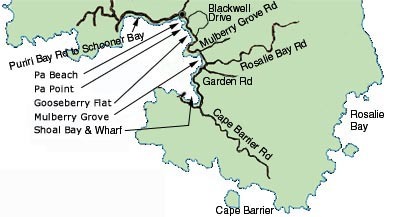 Sheltered harbours, general store, fuel, water, boat ramp, dive fills, Burger Bar (seasonal), Boat Club Bar & Restaurant, information centre. Kayaking, fishing, DoC walking tracks. Tryphena - Traditional Maori name for the harbour and area was 'Rangitawhiri' or 'the day of welcome' and refers to the powhiri received by the explorer 'Kupe' when he visited in the early 14th century. Sandy beaches for swimming, kayaking, fishing, snorkelling. Petrol/diesel available at Stonewall Store but not at the wharf. Kayak hire, charter boats, general store, bottle store, dive fills, laundromat, pottery. ● Drift Inn B&B 1 King & 1 Queen bedrooms. Shared facilities. From $125pn double. ● Earthsong Lodge B&B from $664pn single, $762pn double. Dinner+B&B from $785pn single, $995pn double. Sleeps 5 in open plan room. Sleeps max 4 adults or 2 adults/3childs. Seaview Unit & Garden Unit Sleep 2 ea. Sleeps up to 6 in queen, double, 2 singles. 2 separate units, double room. Self-contained. ● Shoal Bay Chalet Ph:0211387293. Sleeps 5 in 3 bedrooms + loft. .
Units from $195pn for 2 + Cottage sleeps 8. From $190pn for up to 4. Whangaparapara - Name means muddy harbour. Sheltered harbour, fair anchorage except N, NE and E. Mooring may be available through Great Barrier Lodge. Fuel, water, shop, boat ramp, dive fills, charter boat, kayak hire, hot springs walk, fishing. ● Great Barrier Lodge - opening 1st Dec 3 double harbour view studios, 3 suites for up to 5 guests, 2 cottages for up to 5 guests. From $110 pn for two.